I have to admit – at first, expressing nucleotides of the genome of a virus as pitches of the melodic scale struck me as a gimmick. Yes, one could draw a connection between adenosine and A, between cytosine and C and so on, but to what end? Once the music started, however, this approach became much harder to dismiss. Applying scientific rigour to music is nothing new and has been done in the past with math (both Satie and Bartok used the golden ratio for their works), so why not with biochemistry? Alexandra Pajak, native of Athens, Georgia studied both composition and sciences and her work reveals a fascination with both subjects. Then there is a general sense of unease, creeping in. This undeniably beautiful music expresses HIV, a virus responsible for the destruction of much beauty and art. On one hand, it’s tempting to assume that nature’s creations achieve a high level of symmetry and beauty and a virus should not be exempt from that principle. On the other hand, what terrible beauty is there to be found should we glimpse inside the genome of the plague, syphilis, smallpox or even flu? These ruminations tend to accompany listening to this oddly-concordant composition, performed with aplomb by the Sequence Ensemble. A special mention goes to Timothy Whitehead, whose piano decodes the protein connections with an astonishing clarity. This strange and disturbing recording reveals itself to be much more than just a mere gimmick! “Silver Pony” is the latest in a long line of releases in the varied oeuvre of singer Cassandra Wilson. Getting a new Wilson disc made me feel a little like a kid on Christmas morning, but this wasn't exactly the pony I was expecting to find under the tree. Wilson is at her best when she takes rock and pop tunes and, along with her always innovative band mates, reworks them into atmospheric beauties. Her version of Neil Young's Harvest Moon from the Grammy-winning “New Moon Daughter” with Toronto guitar alchemist Kevin Breit, being a prime example. While “Silver Pony” has a few studio-recorded trademark Wilsonisms - like the funky Forty Days and Forty Nights and Watch the Sunrise, a duet with John Legend — what dominate the album are the live tracks. With many of the songs weighing in around the seven-minute mark and extended soloing from piano player Jonathan Batiste, drummer Herlin Riley and guitarist Marvin Sewell, there's a lot of hay to chew on. Wilson's voice is as deep and nuanced as ever and the interplay between the musicians is a lesson in developing ideas on the fly. Anyone who likes their tunes in nice, neat A-A-B-A packages should probably hitch their wagon to some other horse, but if you want to hear veteran performers giving free rein to their creativity, saddle up and ride. This double album reflects what appears to be a mini trend: skilled performers of disparate instruments and music genres who once never would have thought of sharing the same stage, coming together in collaborative un-scored improvisation. The violinist Malcolm Goldstein (b. 1936) is an American born composer and violinist, specialising in free improvisation. Active in the new music scene since the early 1960s, he has developed a totally individual and original approach to violin playing, one which on first hearing sounds distinctly unorthodox. Goldstein’s approach is not to make the violin sound as it “should” in a conventional sense, but to explore making music on it from scratch. Far from being a naïf however, his approach is solidly rooted in the 20th century avant-garde music mainstream and also in Eastern European violin playing traditions. Based in Montréal, the pipa soloist Liu Fang (b. 1974) has shown a commitment to crossing boundaries. Having obtained a solid foundation on her plucked lute-like instrument at the Shanghai Conservatory for Music, she has performed throughout the world and released 10 albums. In addition to her repertoire of Chinese traditional music Liu Fang has also embraced the culture of her adopted homeland. Her premieres of works by Canadian composers including R. Murray Schafer and José Evangelista demonstrate that. Along the Way is the latest installment of what she calls her “Silk and Steel” projects in which she collaborates with leading non-Chinese musicians from various traditions. With events such as Richard Nixon’s China visit the subject of modern operas, why not 2005’s Hurricane Katrina, which nearly destroyed New Orleans? That’s what composer Ted Hearne has done with this 70-minute song cycle. It’s scored for five singers and 11 musicians, including horn and string ensembles and a rock rhythm section. Winner of many awards since its premiere at the Piccolo Spoleto Festival, Katrina Ballads is a mature work that belies Herne’s age of 28. Witty as well as inventive, the libretto consists of vocalized versions of transcribed sound bites from New Orleans residents, reporters and officials. Almost every track is given a finer point by the arrangements which adapt variants of notated, jazz, and pop musics to the program. There are many standouts, including Herne’s zippy and jivey repetition of George Bush’s infamous “Brownie You’re Doin’ A Heck of a Job”; and “Barbara Bush”, where the ex-First Lady’s saying the underprivileged don’t mind uprooting is mocked straight-faced by mezzo-soprano Abby Fischer accompanied by faux C&W fiddling and honky-tonk piano. There’s poignancy as well. “Hardy Jackson” sung by baritone Anthony Turner is a parlando lament for a victim’s missing wife. There’s also tenor Isaiah Robinson’s fully orchestrated gospel-like recasting of the statement that George Bush didn’t care about black people by rapper “Kanye West”. Impressively as well, Turner and soprano Allison Semple’s musical recreation of an interview between “Anderson Cooper and Mary Landrieu” is an operatic-style recitative highlights swift-tongued talents, while cracklings with the reporter’s indignation towards the platitude-spouting Louisiana senator. How is it that four men with no instruments play trumpet and snare so well? Is it not enough that the bang-on vocals and supremely crafted a capella arrangements and retro-stylings transport us nostalgically back to that era so cleverly reproduced on the “Hi-Fi” cover? Seriously, I’m thinking of asking these guys (who, by the way, offer school workshops) to teach our kids how to play an instrument without having to shell out the dough to purchase one! It’s easy to see why they have performed alongside Bobby McFerrin as well as being nominated for a couple of Junos and playing sold out concert halls across the land. This album mixes new interpretations of classic Cole Porter, Van Heusen/Cahn, Lerner/Loewe with some great original tunes and even innovative arrangements of Joni Mitchell, Neil Young and Paul Simon tunes. Don’t know if they’ve got some Louis Jordan songs up their sleeves but their keen sense of humour and rollicking fun remind me a lot of his good-time musical characterizations. All four, holders of music degrees (York, McGill), obviously studied History of the Rat Pack and its influence on social strata as well as Toward an understanding of be-bop cool. 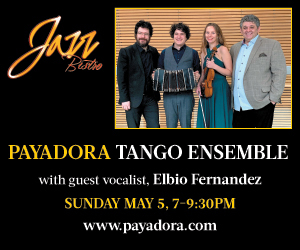 The bandoneon is one of the world's most highly unlikely popular instruments. Tricky to play, a tuning nightmare, and a wheezy creaky contraption, this distant relative of the accordion has made its musical mark for the musicality that it emotes, and the composers who have written for it. Quebec composer/bandoneonist Denis Plante combines the work of his predecessors and his own musical sensibilities to create an interesting aural pastiche for his Trio Boreal, comprised of himself, guitarist David Jacques and double bassist Ian Simpson. The music is wide ranging in its moods, with a little something for everyone’s taste. The mellower trio tracks are the weakest as they run the risk of becoming too clichéd in their laid-back sentiment. But all is forgotten in the Latin influenced Danza with its jolting rhythms and uplifting spirits. Ave Maria is a beautiful solo bandoneon number drawing on the instrument's religious music background. The guitar solo Vallée de la Lune is gorgeous. Most exciting is the group's potential that can be heard in Prelude where there is a je ne sais quoi element of ensemble playing and compositional attributes that forecasts a promising future. Production qualities are excellent – we can even hear the breathing of the bandoneon! But it is the fact that all three musicians are fine performers who love the music they are playing which makes this release so special.